Pita bread has such a wide variety of uses that we always pick some up if there’s a sale on it. One particular use for it is making individual micro-pizzas, where each person can have the toppings they want on their own pizza. This allows everyone to have the toppings they want that others might not want, avoiding such things as The Great Mushroom War. Not only that, our calculations indicate that this actually makes a fairly inexpensive meal. 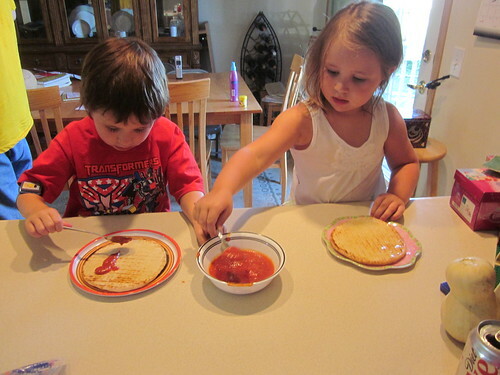 We can easily produce five individual mini-pizzas for less than $5 (if we don’t get too crazy with the toppings). You’ll simply need a pita bread for each person eating, along with a small amount of olive oil and some basic pizza ingredients: sauce, cheese, and whatever pizza toppings you’d like. For our family, that usually involves mushrooms, black olives, turkey pepperoni, and onions, for starters. The biggest step you’ll need to take for early preparation is to just make sure the cheese is shredded and that the vegetables are diced. You can easily store these in containers in the refrigerator until you’re ready to use them. 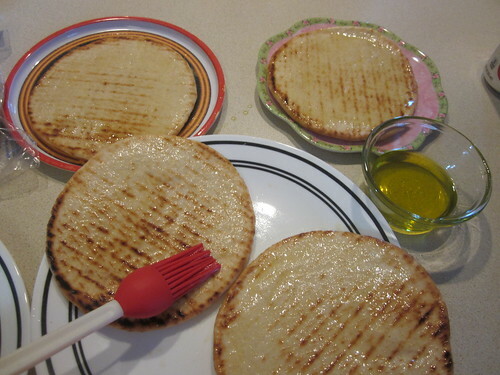 Start by brushing both sides of the pitas with just a bit of olive oil. This will help the crusts cook properly, as well as give them a bit of extra flavor. From there, preheat the oven to 400 F (about 200 C). Then, begin assembling the pizzas in whatever way you like. Everyone can do their own if they so wish, or you can make them yourself. 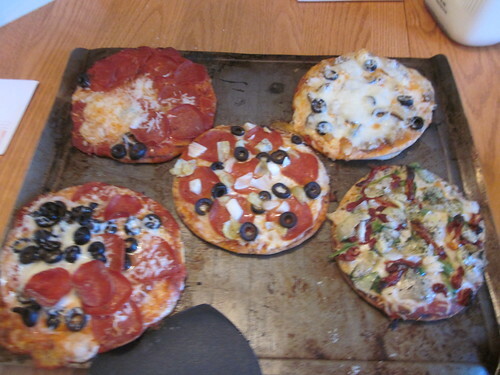 If you wish, you can easily grill these little pizzas, as long as you have the grill at about 400 F. On this day, it was a bit rainy, so we just cooked them in the oven on a cookie sheet. You can also do them right on the racks in your oven if you so choose. Note that if you cook these on a cookie sheet, you may want to spread a thin layer of olive oil all over the cookie sheet to prevent sticking and to make a nice golden bottom on the pizzas. Bake until everything is beautifully melted and a bit browned, then serve. 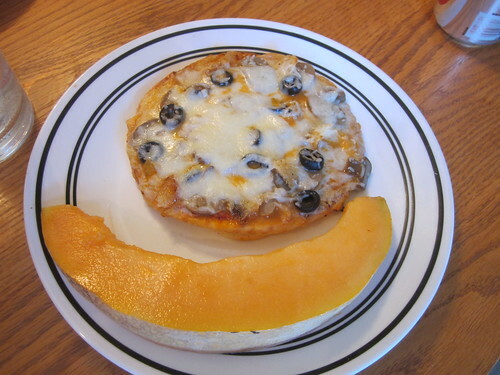 We served ours with some fresh sliced cantaloupe. It’s quick, delicious, and pretty cheap! Go crazy! It’s pizza! Try artichoke hearts, pineapple, sun dried tomatoes, spinach, cabbage, fish, sauerkraut – anything and everything goes as long as you like it. I’ve eaten pizzas with nothing but sauerkraut, onions, and a bit of extra cheese and quite liked them, for example.